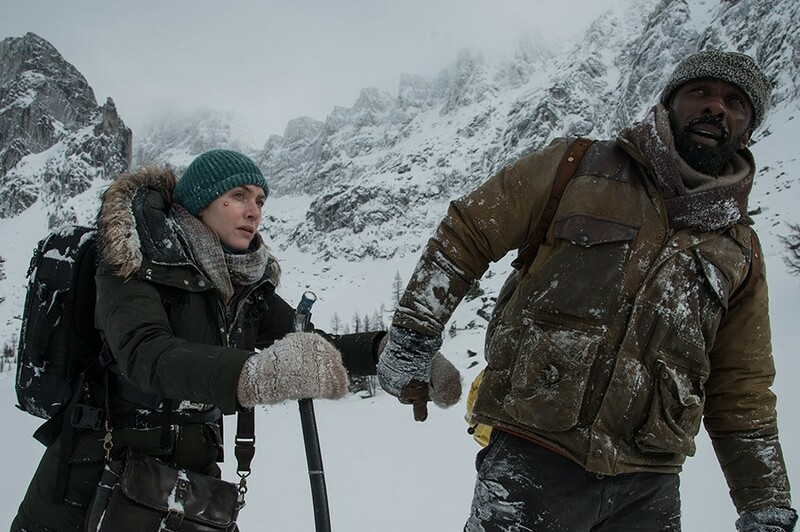 Kate Winslet and Idris Elba do more than just survive in gratifying adventure. Ben (Idris Elba) and Alex (Kate Winslet), two unconnected travelers, are part of the crowd at an airport in Idaho when the airlines cancel all outgoing flights due to an approaching snowstorm. Passengers are inconvenienced. Ben, a dapper-looking British neurosurgeon, is on his way to care for a patient. American photojournalist Alex, dressed in fatigues and fresh off a job documenting neo-Nazi skinheads, is scheduled to be married the next day. As it turns out, their individual occupations will play significant roles in what is going to happen to them. Alex and Ben introduce themselves and decide to look for alternative ways to get to Denver. She leads him to an aircraft hangar where a rumpled pilot named Walt (Beau Bridges) agrees to fly them there in his twin-engine prop plane for $800. Walt is unconcerned about the coming storm, so much so that he neglects to file a flight plan. Off they go, and unforeseen events take place — things involving medical emergencies, collisions, rugged terrain, critters, pitfalls, and all the various mishaps we might anticipate if we were precipitously dropped into the middle of frozen flyover land with nothing but a handful of candy bars, our winter clothes, and the pilot's dog, Dog (played as a team by canine actors Raleigh and Austin). Snowy mountain plane crash survival adventures, of course, form one of the movies' sturdiest and most entertaining subgenres. The all-time champ is probably the Andean ordeal Alive (1993) in all its versions, involving heroism and cannibalism in equal measures. But The Mountain Between Us, by Palestinian-Israeli director Hany Abu-Assad — with a screenplay by Chris Weitz and J. Mills Goodloe, from a novel by Charles Martin — sets itself a more difficult task. Based on the film's advertising art as well as its unwieldy title, it's obvious from the beginning that Alex and Ben have an obligation not only to survive on that wintry mountainside, but also to fall in love. Stranger things have occurred in the history of motion pictures, but Winslet, Elba, and their director, Abu-Assad (he made the brilliant 2013 political thriller Omar), tell their simple, unadorned story in the most straightforward, bracingly declarative fashion. Just a woman, a man, a dog, the unforgiving wilderness, and the will to exist. As such, the film packs a powerful emotional punch to go along with its field-and-stream mishaps. Spoiler alert — please stop reading here if you want to be surprised by what should have been fairly predictable. When Alex and Ben, alone (except for faithful Dog) in their shelter under several feet of snow, finally feel safe enough to be comfortable with their feelings for each other, they make love. A routine scene in a conventional-style contemporary drama, except for one thing: Winslet is white and Elba is Black. America is in the midst of essentially the same anguished, drawn-out "discussion" of race we've been having for the last 150 years, but interracial love scenes as sincere and gratifying as this are very rare — and made all the more satisfying by Winslet and Elba's ultra-naturalistic performances. Alex and Ben's chief goal is to walk off that mountain alive. Anything beyond that is a gift. That's exactly what their love scene is, in the context of their harrowing experiences — a gift. The fact that we could see it coming doesn't lessen its impact a bit. Winslet and Elba, a pair of English actors embracing in a cabin somewhere below the tree line in Colorado, make the sweetest American screen couple of the year, hands down. Go figure. The Mountain Between Us Directed by Hany Abu-Assad. With Kate Winslet and Idris Elba. Opens Friday.